Harleys - Cobh Guest House and Self Catering Suites in the heart of Cobh, County Cork in Ireland offers high quality cobh guesthouse accommodation. Located in the centre of Cobh, Harleys is on the Titanic Trail and is only a 2-minute walk from the historic town centre of cobh and spectacular harbor. Carrigtwohill and Fota Island is only a 10-minute drive away. Harley's is the ideal place to stay whilst you are looking for accommodation in Cobh with its friendly welcome, close proximity to the town centre and to cork city and breath-taking views of Cobh Harbor. Cobh itself offers a wealth of activities such as fishing, sailing, horse-riding, charming walks, and historic landmarks. Harleys Bed and Breakfast in Cobh is a family business managed by a local family willing to give you advantage of sharing comprehensive knowledge about the Cobh town and events happening in the area. On arrival you will meet your host Kevin Murphy. At Harleys, Kevin likes to look after his guests. In his own words, "My objective is to ensure that all our guests have an enjoyable stay.". So the trained staff of harleys keeps the day-to-day track of all the guest and do their best to look after every each individual to fulfill their needs. All rooms are en-suite and delightfully decorated, with luxury and comfort in mind. All have harbor views and are equipped with direct dial telephone, T. V., tea- and coffee-making facilities, and are furnished to the highest standards. The guestrooms in Harleys BnB in cobh offer superb harbor views – you will be able to view Cobh Harbor and look across to Spike Island and The Old Head of Kinsale all from the comfort of your bed. 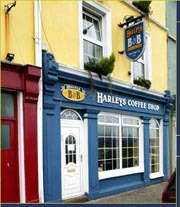 Are you interested in Self Catering in cobh, Harleys Self Catering Suites has the answer. Superbly furnished, two deluxe en suite bed rooms, kitchen, living lounge over looking to the harbor, just about right for a holiday in cork away from home at a price of budget hotel. Maid service on request. All inclusive or non inclusive packages for fishing breaks, family holiday in ireland, golf breaks, commercial rental, weekend away.